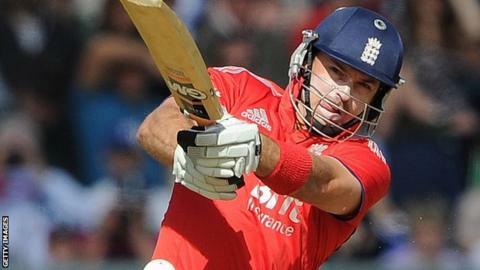 England one-day batsman Michael Lumb has passed up the chance to play in the Indian Premier League and agreed a new three-year contract at Nottinghamshire. The 33-year-old, who opens the batting for England in Twenty20 cricket, joined Notts on a three-year deal for the start of the 2012 season. Lumb said: "I've played in the IPL and feel I've ticked that off my list. Now I want to win more at Nottinghamshire. "The four-day game is the pinnacle of county cricket." Lumb, who will play for Sydney Sixers in the Big Bash in January before joining England's Twenty20 squad at the end of the month, scored 1,037 runs at an average of 47.14 in the four-day game last season. Director of cricket Mick Newell was delighted Lumb has extended his stay. "Michael has become a key figure for us in all formats and we were very keen to secure his commitment," said Newell. "The IPL was a factor in the negotiations but it was clear that his ambitions were identical to the aims of the squad and his batting will be important in enabling us to achieve them." Notts have already agreed with Samit Patel and Alex Hales that they will be allowed to play in the IPL if they earn big contracts.